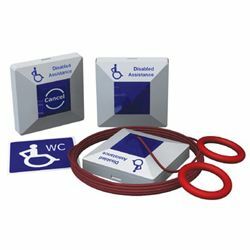 The Safety Centre are pleased to introduce our selection of Disabled Toilet Alarm Kits. This kits are handy all in one kits ideal for a single stand alone disabled wc, which can be easily added to in order to create larger systems. This range includes kits from leading manufacturers such as C-Tec and Honeywell. For more information on Disabled Toilet Alarm Kits contact us NOW on 01200 428 410 or use the Livechat facility below. Honeywell have introduced their new Disabled Persons Toilet Alarm Kit / Emergency Assist Alarm Kits into the market place. These kits have an attractive design and consist of all the components needed to create a single stand alone disabled toilet alarm. The kits consist of a ceiling pull unit, power supply, reset point, overdoor LED indicator / buzzer and wc sticker. They can be easily added to using individual components to create larger systems if required. The C-Tec range of disabled toilet alarms are available in two varieties. These are the standard plastic disabled wc kit or the stainless steel option, which is ideal for aesthetically sensitive installations. This range is based upon the tried and tested C-Tec 800 series call system range which has been in use throughout the UK for many years. If you’re interested in these products you may also be interested in our Emergency Lighting Batteries and Portable LED Lighting ranges.